The Susan G. Komen 3-Day for the Cure Walks are challenging and exciting events held in multiple US cities each year to benefit breast cancer causes. Walkers are challenged to walk approximately 20 miles a day for three days. They camp out each night in a tent city. All meals, snacks, and trail support are provided. Each walker must raise a minimum of $2300 in donations to participate. The dates and locations are announced in September each year. There will be no walks in 2018 in these former locations: Tampa Bay, Arizona, San Francisco Bay Area, Boston, Cleveland, Chicago, Washington DC. The registration fee is $90. Register online or by mail. Once registered you will receive your training packet and be assigned to a coach. Orientation sessions are held in the walk cities and walk training groups are held in many locations. The event is open to both men and women, age 16 and above. Minors must participate with their parent or legal guardian. All walkers are required to have health insurance during the event. Each walker must collect $2300 in donations in order to participate. Donations may be collected by cash, credit card, or check. Each participant can set up a personal web page on the 3-Day Walk site to make it easy to collect donations online. Walker coaches provide advice on how to host a fundraising party and how to ask for donations. The Susan G Komen for the Cure organization disburses the funds to worthy breast cancer charities. Walking for 20 miles a day for three days is a very challenging endurance event. Proper training is necessary, similar to training to walk a marathon. 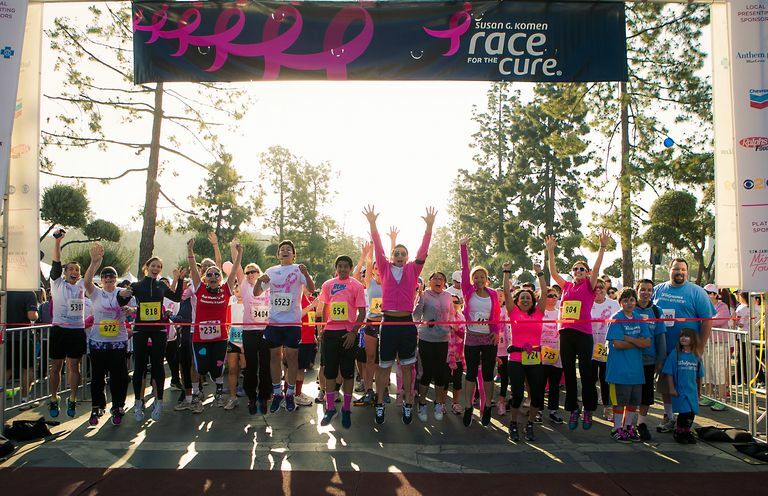 The Susan G. Komen 3-Day for the Cure provides training advice, group training walks, and a coach to assist walkers in their training and in selecting the right clothing, shoes, and gear. The event provides full support during the walk—marked trail, stops every 2 to 3 miles for water, sports drink, snacks. Lunch on the route. First aid and blister care. Sweep vans patrol the route looking for walkers who need assistance. Walkers may end their day's walk at any of the stops along the way and be taken to the camp. There is no penalty for failing to complete the total distance each day, and for safety's sake, people should not overextend themselves. Each day ends at camp where hot showers and a hot meal are provided. Walkers are assigned to 2-person tents. Each walker provides his/her own sleeping bag and pad. Clothing and gear are transported for the walkers, but there are weight limitations. Each evening there is entertainment. Walkers are encouraged to stay at camp rather than arrange other accommodation. The event depends on volunteer crew members to support the walkers in everything from setting up the camp, serving the walkers at the stops on the route, marking the route, serving meals, patrolling the route, etc. Crew members also register for $90 and are provided the same meals and camping accommodations for the walkers. outreach programs. The walks raised $800 million from 2003 to 2016. Many people find the 3-Day Walk to be an inspiring and even life-changing event. They come to the walk for various reasons—to fight breast cancer, to do a challenging walk, etc. While at the event they encounter human kindness on a level often missing in daily life. While they are hot, exhausted, and footsore, they are there together, for each other, and being pampered by the volunteer crew who are likewise hot, exhausted, and footsore. Whining is not allowed. Unkindness is not allowed. Tears of joy and hugs are allowed. For the final walk into the finish, cheered by your friends and relatives, you feel you have really done something. And unlike the marathons, you have not done it for yourself, but for every woman and man who is touched by breast cancer. At each closing ceremony, a huge check is presented to a medical research center or community outreach group for the fight against breast cancer. Can the world be changed by walking? Yes.